On Saturday, December 12, 2015, dancer, television personality and Season 14 winner of “Dancing with the Stars” Peta Murgatroyd and teen star, recording artist, Radio Disney host and Children's Miracle Network Hospitals Teen Ambassador, Alli Simpson, hosted pediatric patients at the Winter Wonderland Ball presented by Children’s Miracle Network Hospitals and produced by Trueheart Events. Guests were photographed for the “Band Together For Kids” holiday campaign. The new campaign brings attention to the importance of urgently needed donations to children’s hospitals. “Dancing With The Stars” Season 18 champion Maksim Chmerkovskiy was by his fiancée’s side at the event and they had an incredible time dancing with and getting to know Miracle Kids from Children’s Miracle Network Hospitals including Children's Hospital Los Angeles and Children's Hospital of Orange County. Maks even joked that he was afraid that Miracle Kids Max Page and Nathan Ferrell were too cute to be hanging out with Peta and that they would steal her heart. DJ Kid Fish treated the crowd to a slow jams set that included “At Last”, “All You Need Is Love” and “True” which got everyone on the dance floor to slow dance with their families and friends. Maks waltzed with the beautiful and effervescent Miracle Kid Belle Helton, while Peta had a blast dancing with Nathan. “Secrets and Lies” star Edwin Hodge boogied with a group of local Miracle Kids. Paralympian and “Dancing with the Stars” finalist Amy Purdy flew in for the event and twirled around the dance floor with Miracle Kids and spent the afternoon taking fun holiday photos in the photo booth with them. “So You Think You Can Dance” alumni Serge Onik, Jacque LeWarne and Zack Everhart were joined by “SWAY” cast members Henry Byalikov and Merv Samuel at this very special holiday party. Two talented dance stars from the “Step Up” movie franchise Rick Malambri and Chadd Smith brought their beautiful families to the event. The dance community came out in full force to support Children’s Miracle Network Hospitals at the Winter Wonderland Ball. “The Office” star Oscar Nunez and his family and “24” star Carlos Bernard and his wife enjoyed the holiday festivities complete with beautiful décor by Revelry Event Designers. Guests were transported into a magical Winter Wonderland with face painting, metallic tattoos by Lulu dk, balloon art by Big Red, a holiday themed photo booth by Fun Captured Photobooth and sweets and treats. Santa surprised the kids and everyone got to sit on his lap and share their Christmas wishes with him. The Winter Wonderland Ball took place at the famed Avalon Hollywood where partygoers enjoyed gourmet coffee from Nespresso, an organic juice bar by Suja, frozen treats by Viva Pops, and delicious cotton candy by Love Swirls. Guests also were treated to a gourmet burger and fries station for lunch and hydration powered by AQUAHyrdate. “Blackish” star "Jenifer Lewis, Miss America Kira Kazantsev and Miss USA Nia Sanchez brought holiday cheer to the kids at the party. Guests were gifted with gorgeous inspirational jewelry by Good Works Makes A Difference and everyone was seeing wearing their special key necklace at the party. Too Faced Cosmetics and Tokidoki included some treats in the gift bags everyone took home. DJ Kid Fish curated the musical soundtrack for the event, which included party hits and holiday favorites. Peta and Alli welcomed guests to the event and spoke about how important the work Children’s Miracle Network Hospitals does for families across North America. 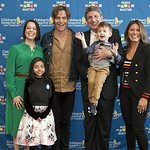 Children’s Miracle Network Hospitals President and CEO John Lauck introduced Miracle Kids Belle and Nate who shared their stories from the stage. Nate told partygoers that he is going to be the next contestant on “Dancing with the Stars” and the crowd erupted with cheers. Alli Simpson and her father, Brad performed their new single, “Enough” (co-written and performed with brother and pop star Cody Simpson) and there wasn’t a dry eye in the room. Alli, Cody and Brad have dedicated their song to Miracle Kids everywhere and with a $5 monthly donation to the organization’s monthly campaign, supporters will receive a download of this special song. Donations can be made at BandTogetherForKids.org.